Liesbeth Noordegraaf-Eelens (1973) is associate professor at Erasmus University College. Currently she is the member of RASL’s Academic Board overseeing the Double Degree programme. She has a background in economics and philosophy and published books like “De overspelige bankier” en “Op naar de volgende crisis”. Her phd “Contested Communication” was an interdisciplinary research on the communication of Central Bank Presidents in times of crisis. Since working for Erasmus University College (2012) she focusses on innovation in Education, both in research and education. The leading questions herein are “Why are we doing what we are doing? and Should we keep on doing, what we’re doing?”. To develop more societal relevant transdisciplinary education and research she co-initiated the Rotterdam Arts & Sciences Lab (RASL). This is a cooperation between Erasmus University, Willem de Kooning Academic and Codarts. 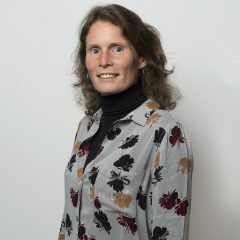 Since January 2016 Liesbeth Noordegraaf-Eelens is member of the Council for Health and Society. Liesbeth is married and has four children.